"Complaining," said Rilke, almost a century ago. "The eternal vice of poets." But consider the poet in the 21st century! The digital age has amplified whingeing to a remarkable degree. This means, for instance, that Ms TN can now alert almost 5000 people instantly via Facebook and Twitter that she is having the vapours. The fact that I always feel embarrassed afterwards for megaphoning such trivia never seems to stop me. Ah well. My hope that what TN lacks in breadth is made up for in depth is coming up hard against the fact that presently I am managing neither. The only positive sign is that my nearest and dearest seem to have caught the same insidious lurgy that's pole-axing me. Nothing is so reassuring as a virus shared. As a result, I am horribly behind on reviews, and still feeling deeply incapable. I thought of taking a leaf from the Liveable Cities people, who today rated Melbourne as The World's Most Liveable City Of 2011 (although, it seems, our culture is merely "tolerable"). It seems the top rating given by whoever measures these things is "acceptable". So, with this level of lively engagement firmly in mind, I can tell you that the three shows I have managed to see in the past two weeks - Circle Mirror Transformation at the MTC, Chunky Move's It Sounds Silly, and Interface, a short dance piece that was part of Melbourne University's Mudfest, were all "acceptable". 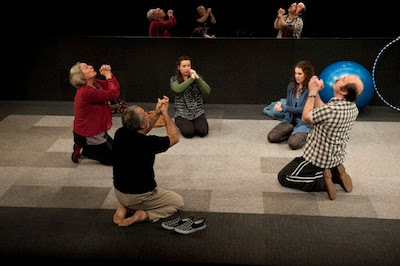 Circle Mirror Transformation is one of two plays by US playwright Annie Baker presently running in Melbourne - the other is The Aliens, at Red Stitch, which I hear from various sources is worth worth a visit. Aside from noting the fine cast - Deidre Rubenstein, Roger Oakley, Ben Grant, Kate Cole and Brigid Gallacher - I trotted along with no sense of expectation. On the whole, I haven't done too well with the contemporary American playwrights we've had on show here. But Circle Mirror Transformation is, in the best sense, a charming play, and unexpectedly disarming. Its conceit - five misfits meeting during a six-week acting class at a community college - is written, performed and directed with a luminous simplicity that makes it cumulatively moving. The narrative unfolds obliquely through acting exercises and mundane conversations. Almost incidentally, as is so often the case in these kinds of workshops, we learn all about the five characters, their vulnerabilities, fears, dishonesties and histories. We watch relationships develop and collapse. They finish the workshops, and then head off into their different lives. That's all there is to it. What makes it shine is Baker's inexorably gentle but completely unsentimental excavation of the loneliness of each character, his or her desire to make contact with others, their different failures. Directed with an invisible hand by Aidan Fennessy, the performances are models of actorly clarity, modestly exemplary in their nuance and feeling. Bucking a trend, Circle Mirror Transformation is much more than it appears to be. It can bring out the worst in an audience, if there happen to be any wannabe actors present. I've never heard so much ostentatious I'm-in-on-the-joke laughter as on the night I went, to the point where some of its quietly moving moments were in danger of being terminally trampled. I think a marksman in the auditorium, armed with one of those guns used to sedate polar bears, might well be the thing. Chunky Move and SIGNAL'S It Sounds Silly was performed free over two nights in a public place - by the Signal box behind Flinders St Station - and solved the problem of ambient noise by both incorporating the sounds of, for example, passing trains, and by amplifying Alisdaire Macindoe's sound design (complemented by some spectacular lighting and multimedia) to the point where it didn't matter. It unfolded on a chilly but clear night before a seated audience and a gathering crowd of curious passers by, which gave it the edgeless feeling of a flash mob. Choreographed and directed by Adam Wheeler, the 28 dancers consisted of four young professionals and 24 dancers from Signal, an arts studio for young people aged 13 to 20. The kind of energy this created as the dancers spilled out onto the performance space was electric. It was almost a dance version of Belgian company Ontroerend Goed's Once and For All We’re Gonna Tell You Who We Are so Shut Up and Listen, an irresistible show by and about young people that toured to the Arts House a couple of years ago. Very different in discipline, it had a similar kind of emotional impact. The performance opened with four dancers emerging in hoodies from what appeared to be a kind of cubby house constructed of mattresses. The dancers exploded into a short and spectacular introduction of hiphop-based moves, using the mattresses to cushion themselves as they flung their bodies to the ground. Then the rest of the company joined them, and the dance evolved in all sorts of unexpected ways, away from the mass culture vibes of hiphop to various explorations of movement, both collective and individual. The costumes were variations on an identical uniform, colourful t-shirt and pants, but the emphasis here was on the individuality of each dancer: their faces were projected on the signal box, or they spoke to the audience. At one point, every dancer told us the thing of which they were most afraid. Their confessions varied from climate change to being afraid they would never find anyone to love to a strangely shaped tree outside the bedroom window. It was only half an hour long, but It Sounds Silly was a rich and detailed performance, moving and exhilarating. Exemplary youth art. Lastly, the single performance I managed to make for Mudfest before I hit the wall was Interface, a short dance work performed by Jacqui Aylward, Laura D’Augello and Carla Lusi at the Guild Theatre. I was surprised by the ambition of this work, which explored the world of online identity with multimedia projections and a soundscape by Brenton Aylward and Daniel O’Keefe. The performers integrated classical ballet with contemporary dance in ways which were sometimes naive but were also inventive and aware of the present moment. With the barest of resources but some big ideas, they generated some powerful moments. It made me sorry about everything else I missed. Circle Mirror Transformation by Annie Baker, directed by Aidan Fennessy. Sets and costumes by Marg Howell, lighting design by Philip Lethlean. With Deidre Rubemstein, Roger Oakley, Ben Grant, Kate Cole and Brigid Gallacher. Melbourne Theatre Company at the Lawler Studio, until September 17. It Sounds Silly, choregraphed and directed by Adam Wheeler. Multimedia by Robin Fox, lighting design by Benjamin Cisterne, sound design by Alisdair Macindoe, costumes by Benjamin Hancock. Performers from Chunky Move and SIGNAL. Signal, two free performances, August 19 and 20. Interface, performed and choregraphed by Jacqui Aylward, Laura D’Augello and Carla Lusi. Music composed by Brenton Aylward and Daniel O’Keefe. Mudfest, Melbourne University. The term I'd use to describe Circle, Mirror, Transformation is sweet, though with a nice subtlety to it. I very much enjoyed it while I was there watching it, but I did come away with not much of it seeming to stick with me - it was just a little to airy to be really memorable. Though there was a sense of craft in the writing which has been absent from a lot of plays I've seen recently. And you're right to commend the actors and director - I think it's a play that, in the wrong hands, could very easily have been turned into something either sentimental and overwrought, and/or too much played for laughs (thus catering to the 'wannabe actors' you mentioned in the review and who also seemed to be there in significant numbers at the performance I saw). Though one thing about the play that did bug me was why the group leader's husband/partner was part of the acting class - it just didn't seem credible to me, and seemed too much a device to allow the playwright to open out some conflict. (In fact, it seemed so unlikely that he'd be there that I kept thinking I'd misunderstood something.) I don't know if it bugged anyone else . . . It didn't bother me, but I actually could imagine a circumstance in that marriage in which the husband might turn up. Yes, a light work, but not an empty one, I think. I found it very plausible that the husband was there - can't recall if it was explicit but I gathered the class hadn't had many sign-ups and he'd been roped in to fill out numbers. He certainly didn't seem to be taking it seriously. I agree that it's a light work but that's not a criticism. It seems to have modest ambitions and succeeds well because of, not despite these. I put some of my favourite shows this year in the same basket. My only real fault with the production is that it emphasises the pathos over the comedy in the script. From what I've heard the original NY production really drew out the dramatic irony of each character's situation, the way that their self-perception is deeply at odds with what we actually see of them. Most especially in the character played by Cole, who promotes herself as a 'real' actor but is evidently a terrible one and left the big smoke for that reason (not for the reasons she gives, ie it was too 'competitive' or whatever). Minor quibble, however. I was probably one of those people who laughed too heartily, although there didn't seem to be many actors in attendance the night I was there. John, however amused you ight have been - and there were certainly things to be amused by - I simply can't imagine you being crassly unaware of the rest of audience or of the actors... And yes, "light" is not a negative criticism on my part either. It's not the same as insubstantial. It's the sort of play which would be interesting to see in different productions. For my part, the gap between self-perception and the perception of others (as Ricky Gervaise said once, the very basis of comedy) seemed quite clear for me in the Kate Cole character. But as you say, that is also a source of pathos. I certainly didn't take the characters at (their) face value, and those shifts of perceptions were some of the pleasures of the production. why are you so often ill? rather judgmental, don't you think, criticising audience members who are laughing in acknowledgment of the familiar....? particularly labelling them 'wannabe' actors...? i'm sure there are thousands upon thousands of plays out there that in some way appeal to a niche demographic, therefore prompting a response at the familiar from that group when they see a part of their world represented on stage...? i'm quite certain it wouldn't escape the attention of Annie Baker that her play would have that response. and what you label 'ostentatious' sounded to me, the night i went, like delight at the recognition of the ludicrous but none-the-less truthful insight into the drama class. Yes, I'm definitely being judgmental. It seriously bothered me. It was a group (with a man who seemed to be their teacher, who was the worst of the lot) who were attracting a lot of looks from the rest of the audience, so it wasn't just me. Personally, I've seldom wanted to strangle a fellow audience member so much. And that includes the guy who checked his email on the phone during a total blackout in PINDROP. A charming play, beautifully acted and directed with great subtlety. (After the way Aidan Fennessy directed The Joy of Text I was apprehensive.) I don't think Cirle Mirror is as strong - or as political - a play as The Aliens, but I enjoyed both. And the audience was quietly appreciative on the Tuesday night I went. Perhaps your marksman had been installed by then, Alison. I haven't seen this, but it looks fascinating and thought provoking. This post has already got me wondering and analyzing. Thanks! Circle Mirror Transformation is a great show and suitably restrained in all aspects of the production. And it looks fantastic without being ridiculously over designed! Actually all of the shows in the Lawler Studio season at MTC have looked great this year, simple and striking. What a great space that will hopefully be used more often in years to come.